Irrespective of education and family background, it’s a common human nature to dream about more and more money. If you are well educated, the easiest way to fulfill your dream is to get a high paid job. A high paid job satisfies one’s basic needs and at the same time provides the key to spend the surplus in fulfilling one’s dreams like buying homes, cars and another luxury lifestyle. 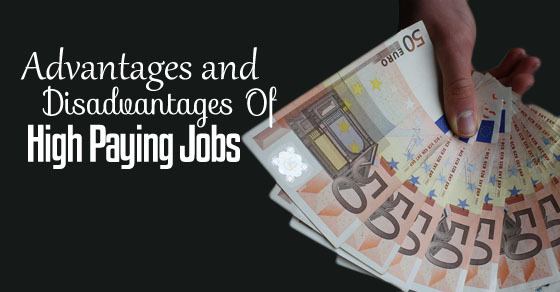 It’s true that money counts, but while choosing a career one should be very cautious in deciding the salary advantages and disadvantages of high paying jobs in long run. The most attractive word in a professional life is “Salary”. Moreover, when this salary is high it gives a great motivation to the one who is drawing it after a laborious work and hard study. A high paying jobs gives the mental satisfaction of the full utilization of one’s studies and the cost engaged behind the study from schooling till college. Good mind reflects a good human being. When one draws a high salary, the job is ought to be a very respectable one. A doctor is always respected for his service towards the community where an engineer who serves the community with his work is also respected from heart. The high position they hold in the society gives them the power & prestige to serve the community unbiased. And also hard earned money brings respect of friends, relatives & family as well. The jobs are such that their demand curve is never downward. A doctor’s demand is ever- rising, wherein a well experienced engineer is a treasure to a company. Again a company would always prefer to retain a good management employee who is dedicated towards his work and is worth a high pay. A high paid job for a suitable candidate can never bring a threat towards job stability. When one’s hard work and laborious study pays in terms of high pay, he/she is satisfied to the full. He/ She utilize the money to the fulfillment of his/her dreams and responsibilities, which in turn makes the one happy and contended. His mind states in the purest form and the person becomes happy from within. His/ Her mind body reflects a happy being that stands as an example in front of many in the same path. With a high paid job the money flow in the economy increases in a variety of ways. Firstly the company hiring a person on a high pay will always try to utilize the intellect in a possible way. One who is highly qualified can engage his ideas in getting business and provide service in a wide field and also from abroad as well. This would lead a rise in the GDP. Gross Domestic production is the result of the summation of the total production that took place in the economy. GDP denotes that Income= expenditure = production. GDP is a very crucial indicator of an economy’s progress. A rise in GDP denotes a rise in the standard of living of its citizens. A society prospers when it’s free from diseases & ailments and is educated up to the mark. When one is able to fulfill his/her basic needs like shelter, food & clothing easily, the next basic need comes for proper healthcare & education. When one gives the family proper health protection and education, then it directly counts to the wellbeing of the society. When one enters high paying jobs, it’s obvious that the job will be respectable and of high status. This gives an opportunity to the worker to work in a healthy working environment which in turn nurtures his knowledge and skill to the fullest. It becomes easier for the employee to give his fullest output which in turn gives benefit to the company as a whole. To get a high paid job one has to qualify oneself to that mark by completing several courses, cracking various competitive examinations. This process of getting a well-paid job in turn increases the study period thus resulting in late start of the career. When a person starts his/her career late, the time span of the career eventually gets shortened which in turn lowers the opportunity to earn over a long period of time. A high pay along with it brings a demand from higher working hours. Whenever a company invest good money behind one, then it becomes obvious that they would demand and squeeze out the maximum from him/her. They would like to extract more and more from the one they are paying so high. They would give assignments beyond their working hours to finish. Sometimes such high paid jobs does not bear any working hours mentioned as such, which easily gives the opportunity to the company to engage their employees to work beyond time or extra time mostly. A high paid job is directly proportional to higher work pressure. When your company pays you well you are bound to abide by what they say and direct you. It is very likely that such jobs will bring untimely assignments, with tight deadlines and merciless work pressure. Most of such jobs buy your will and you are bound to say yes to such work pressure as you might be scared of the consequences of attrition from such a pay. Most highly paid jobs comes with packages of high end Laptops with unlimited internet facilities, cell phones and many more, But these are actually ways of the company to buy your personal time as well. The employer easily gives you assignments to finish within a time span though you have left office. He bounds you to work from home though you are beyond your working hours. One can hardly find rest though being at home comfort. His/her brain works being away from office under tremendous pressure. A high paid job buys your family life as well. A day cannot be more than 24 hours. When you are running after money and more money it’s obvious that you will have enough time neither for yourself nor for your family. And when you are employed by somebody you are bound to follow the instructions and complete the task within a stipulated time span which obstructs you to spend time with your family. It would happen that you could not turn up to commitments to your family just because of your boss’s assignment need to be met. Once engaged in such high paid assignments one would have to forget vacations, occasions and all which in turn will turn a human into a machine thus cutting all bonds of relations, destroying family peace and harmony. As a high pay promises you a dearth of time, running behind work deadlines, it ruins your health as well. You would not get time at all. Daily stress, tension and restless hours, sleepless nights will result in degradation of health without doubts. To get high paying jobs the kind of education needs to be gained is very costly and not everybody can afford it. To become a doctor or an engineer is very costly and it always needs to be kept in mind that the job is worth the study. Education loan to pursue such hefty courses are available, but not many meritorious students can be eligible to apply for the same. There occurs a compromise between merit and money also. Associated with a high paid job is the risk of getting jobless. When one climbs too high the risk of falling and breaking bones increases proportionately. Same is the condition with a highly paid job. Getting jobless and the fear of it is higher here than a low paid job. For example, if we take the case of commercial pilots in USA, they face continuous uncertainty in their career because of the condition of the airline industry and constant competition from low cost airlines. High salary brings with it the achievement of better and best lifestyle with high end and luxurious items for living. In such high paying jobs as there is opportunity to buy high lifestyle there always remains a risk of falling jobless resulting to diminishing of the standard of living. Some of the highly paid jobs are associated with maximum stress and tension. Some of them are the jobs of air traffic controllers and surgeons whose decisions always matter for lives. In their work there remain zero margins for error. Stress related to job result to be more taxing than anything else resulting to physical & mental illness. A fear of not performing to the mark always haunts the mind of a person engaged in a high paying jobs. There prevails high competition level in such offices. So if anyone fails to perform well to the boss’s expectations he/she might be demoted or be losing his/her job. Sometimes people go for a wrong job just in lust of higher salary. We in this world run after money, sometimes forgetting our passion and will. What we want to do in life most of the time gets suppressed for lust of money and we accept those high paid job offers which we were never ready to or very less interested to do. In a highly paid job there remains very less opportunity to grow. The career becomes stagnant in one point. If one gets every satisfaction in a go, he/she finishes his/her erg to eat more, the same happens when one gets every requirement from a single job, his erg to grow stops and where growth stops we know life ends. Most of the highly paid jobs associate high degrees of risk with it. For example an air traffic controller has to be highly alert in his job else will be responsible for lives, on the other hand a small mistake in a doctors diagnosis or surgery may cause a loss of life. An alluring salary and perks are always responsible for blocking career options and choices. Choices become less and options sink with high paying jobs. One feels insecure in leaving a job which is highly paid and pursuing a career in a trait which one dreamt of. High paid job pertaining to higher work hours and pressure makes a man workaholic. Always work and no play make Jack a dull boy. No time for oneself, any recreation or recess will bring boredom in life resulting to ageing before time. There would be fatigue in work thus resulting in less efficiency in assignments. It’s true that money does matter the most in today’s world, but still when it comes to choosing a career for a long run a critical analysis of oneself is highly recommended to judge if the job is going to add stars for the future development of self. It’s only you who has to decide before accepting a high paying job offer, whether to think of future and long run benefits or to live in present with a job that pays you well with stress , tension, long working hours, no or less weekends, no family life, degrading health with increasing pressure. However, a person who wants to balance personal life with a sober income prefers not to accept a high pay package.